Some of my absolute favorite New Girl episodes are the holiday-focused ones, and none more so than the Christmas episodes. "The 23rd" is heartwarming, hilarious, and makes me cry every time. "Santa" is filled with wonderful shenanigans and surprises (black Santa!). "LAXmas" is such a great bottle episode, without even technically being a bottle episode and captures the frantic energy of an airport during the holidays. And now we're adding "Christmas Eve Eve" into the mix. How does it hold up, you ask? Pretty freaking fantastic. When I watched the screener for the episode, I tweeted that I cried. And upon watching the screener a second time, the same thing happened. Because this episode is everything about New Girl that I adore and what makes it special: it features character-driven shenanigans, miscommunication, character growth, and ultimately a sweet and emotional ending. It reminds us that these people are friends outside of the twenty-some minutes we spend with them every Tuesday. And it gave me hope that they would continue to grow and learn from one another, but most importantly of all, care for one another. Let's dive into this fantastic episode, shall we? IT'S BEGINNING TO LOOK A LOT LIKE... NOVEMBER 1? The episode begins with that missing loft Halloween, where our character recreated The People v. O.J. Simpson (and no one, apparently, got their costumes). As the clock strikes midnight on November 1, Jess begins her all-in Christmas festivities. If you'll recall from years past, Jess is fully committed to Christmas. It's one of the most endearing things about her, but also — as we see in this episode — one of the most stressful things about her personality. So that's why the loft decides to boycott Christmas, in an attempt to lessen the stress on themselves and lower Jess' expectations. As you might imagine, Jess won't have this and together, the loft manages to come to a compromise: they'll do Secret Santa gift exchanges, that way they won't need to buy gifts for everyone. This, of course, leads to some pretty hilarious shenanigans. We'll discuss the Nick/Jess story in a little bit, but first let's talk about the Winston/Schmidt one because it's pretty fun and also enlightening, because Schmidt learns a lesson. When Schmidt refuses to sign for a package that Winston got for his Secret Santa (Cece), the two decide that they need to try and retrieve it. When that fails, they head to the store to buy her something that she would appreciate. While Schmidt attempts to be forcefully practical, Winston remains... well, winsome in his attempt to get Cece a beanbag chair. Why, you ask? Because one night during a two-person game of Pictionary, Cece guessed the word "beanbag chair," and ever since then, it's an inside joke of theirs. Understandably, Schmidt doesn't believe in Cece's sincerity of the joke, but Winston is adamant. Nevertheless, the two leave with a sensible item for Cece'. ... Except, of course, that Winston returns to the store to purchase the beanbag chair, much to Cece's delight! I admit that I was surprised at how much she remembered and cared about the chair. It goes to show that Cece has come a long way not just as a person, but especially in her relationship with Winston. She might roll her eyes at a "classic Winston-Cece mess around," but she genuinely loves how thoughtful he is and the two have fun together (as evidenced in last week's episode). It's in that moment that Schmidt realizes that sometimes he might not know what's best. In choosing a practical gift, Schmidt missed the focus Cece had on a memory. I love that Schmidt got to learn a very subtle mini-lesson in this episode, because I think sometimes he's too focused on what's right in front of him or what's logical that he misses some of the fantastical stuff. I think the most shocking development in this week's New Girl was the revelation that Nick has noticed Jess' strange behavior ever since he returned from New Orleans. I think it takes Jess by surprise too, as we all typically believe Nick to be oblivious. In his words, though, she's been acting "squirrely." And she has been. Up until recently, Jess has been fighting her feelings for Nick and trying to play the role of supportive friend, even though it's killing her inside. Since she's now with Robby, those feelings seem to have disappeared slightly... maybe. I don't think that if we have feelings for someone — true, deep feelings — we can move on without closure. Jess doesn't have closure with Nick yet; she's still holding onto those feelings tightly, even if she's moving on with Robby. Until she lays those emotions out on the table, I don't think she'll ever have closure. "Christmas Eve Eve" is the first time all season that we get a sense that Nick knows something is up with Jess, and that it's important. This episode also marks the first time that I feel their relationship has transitioned back to season one/two proportions, in the best way possible. Because of course Jess got Nick for her Secret Santa, and she plans this wonderful present for him: she's secretly flying Reagan in for Christmas. Because this is a sitcom, Nick decides to surprise Reagan by flying out to see her. And — again, because it's a sitcom — Jess tries to get him to change his mind without spoiling the surprise. When that doesn't work and Nick actually begins to hurt Jess' feelings by yelling at her, she gives up the secret and walks out the door. Nick's response is wonderful: "So this is what it feels like to be instantly sorry." I love that line, because it reminds me so much of how Nick used to mess up and apologize to Jess (yes, I'm also thinking of "The 23rd" and "Fluffer"). And while I'm thankful that the show has evolved Nick beyond just "guy who screws up" into a functional human being, it's kind of nice to see shades of their old relationship resurfacing. Because the truth is that no matter what happens in the end (and Liz Meriwether, if you're reading this, I expect Nick and Jess will end up together when the series concludes), Nick and Jess will always have a deep connection with one another. Jess is the one person Nick can't stand to hurt. He feels remorse for their fight — even bringing it up to the rest of the group — and decides to make amends. It's no coincidence to me that Nick is the one to bring Jess cocoa at the end of the episode and apologize, while revealing the surprise to her. Nick is always going to be one of the most important people in Jess' life, and vice versa. They can't stay mad at one another for too long — their relationship is too important to fight about stupid things. To me, this episode was evidence of the fact that Nick and Jess' story isn't actually over. It might not be moving, proactively, in the direction we all desire yet, but it's moving even so. And the sweet gesture that Nick (and the rest of the group) makes is oh-so heartwarming. It was probably a bad idea for the group to do Secret Santa name-drawing after a night of partying on Halloween. As a result, Jess forgot to put her name into the drawing and Winston ended up with two gifts. Between her fight with Nick and the lack of significant Christmas fun/chaos this year, Jess is disappointed. She returns to her bedroom with the gift Winston bequeathed her (a hamster), and Nick enters to thank her for his gift and apologize for the way he fought with her. It wasn't even a bad fight and Nick didn't say anything particularly offensive, but again; I love that he apologized and felt so bad that he wanted to make amends. Furguson then enters the room with little reindeer antlers, as music plays from outside of the bedroom window. Jess gets up and sees "snow" falling. 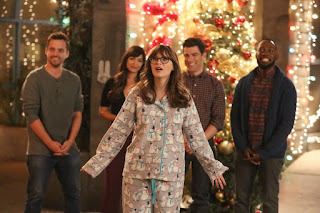 When she walks outside, Cece, Winston, and Schmidt are waiting along with Robby to give Jess her present: Darlene Love (whom Jess mentioned earlier in the episode as being an integral part of her Christmas childhood memories) singing "Christmas (Baby Please Come Home)" accompanied by a choir. It's a lovely moment, where Jess is stunned that her friends would do this for her. Honestly, it's the best Christmas gift they could give her — a memory that she'll cherish and add to her collection of memories for years to come. Nick then invites the elves who were at his bar earlier to join them, and together everyone — Reagan included, who was sprinkling the "snow" from the roof — dances and sings. It's a beautiful, fun, perfect New Girl moment and the kind extremely reminiscent of "The 23rd." Jessica Day may be a little crazy when it comes to Christmas. But her joy is infectious and she means so much to everyone in the loft. Whether it's driving to see neighborhood lights, bouncing from party to party, or rushing through the airport, these people are always there for her at Christmas. I love that, and I absolutely love "Christmas Eve Eve." No, your eyes aren't deceiving you — I didn't review last week's episode "Es Good." I had a screener, as usual, but when it came time to write the review, I just couldn't do it. The episode was pretty un-spectacular, and all it did was confirm that Jess doesn't do casual relationships (a fact we already knew). Thankfully, "Christmas Eve Eve" was much, much better. When I first watched the episode, I thought it was very in sync with "The 23rd." After a second viewing, I hold fast to that assessment. "That would be a great seminar... IN A SCHOOL FOR DEMONS!" "TV Town Song Room? You mean Radio City Music Hall?" "Yeah." "... How could you get so many things wrong in a row?" I think that Zooey Deschanel yelling "SON OF A WHORE!" and lunging for the Christmas tree is the funniest thing she's ever done on this show. "I GOT MOZZARELLA STICKS FOR FINGERS." I think Schmidt has been funnier this season than ever, and it's probably because the New Girl writers have allowed him to comment more on the absurdities happening around him than actually contribute. He's become, in a way, the straight-ish man and I find that role so incredibly hilarious. Max Greenfield's baffled delivery and confused expressions give me joy. "You look like you should be paying child support in Florida." Winston's aliases are SO GREAT. I love that it's a running joke in the show that he makes up new and more absurd ones every day. "Weirdly this is not the first time Nick has failed to mention elves in a crisis situation." "I guess I just have to come to terms with the fact that my wife is a little bit weirder than I thought she was." The end scene is just so delightful and wonderful and happy and I love it. I especially love Max Greenfield's dancing. What did you all think of "Christmas Eve Eve"? Sound off in the comments below, and merry Christmas!